The standard finish for any of the carbon fiber Superlight Harps™ is Classic Black, which is a shiny, high-gloss finish. The surface is very smooth to the touch, and from a distance of 4-5 feet or more the harp appears black, but up close you can see the distinctive carbon fiber material itself, which looks like black herringbone. Most people find it to be a very elegant finish, and in its natural state it is the most scratch resistant finish. 1. Because the carbon fiber material is so thin, the paint adds enough thickness and mass to affect the sound of the painted harps, giving them a slightly more mellow tone. The paint also mutes the sound of the harp slightly, but these harps have such incredible volume to begin with that this is rarely an issue. On the tonal difference, we’ve found that some people prefer the ‘painted’ sound, while others prefer the Classic Black sound. Think of it as you would the same harp model made out of two different woods, and you have an idea of the difference. The two different types of harps would have to be right next to each other, though, to really hear a difference. 2. The painted harps are more susceptible to scratching and chipping than the Classic Black harps. Basically, anything that would hurt your nice, shiny new car would do the same to a painted Superlight Harp™. The painted harps are still impervious to water, humidity, heat, etc. And even the biggest chip would only be in the paint, it wouldn’t hurt the carbon fiber base. 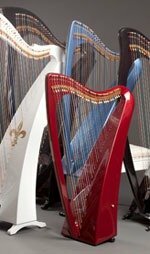 Our painted harps do come with a bottle of touch-up paint that exactly matches the harp, including a brush in the lid. In the event of a large chip, the touch-up paint and the harp could actually be taken in to an automotive body shop for the re-touching. They do a great job, and it’s very inexpensive. 3. There is an additional charge for painting the Superlight Harps™. Painting carbon fiber is a surprisingly tricky procedure requiring a number of coats and lots of sanding. The beautiful, shiny finish looks so easy, but is really a challenge to achieve. 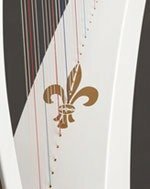 One of the advantages of the painted harps is that we can also add artwork in the form of stencils, done in your choice of color. Between the two of them, they have well over 100,000 choices. 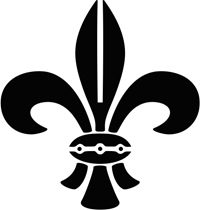 Most artwork will add $200-$400 to the overall cost of the harp, depending on the complexity of the stencil. Multiple stencils will be higher. The one thing to keep in mind when looking at the possibilities is to minimize the number of ‘orphans’ in the stencil. These are areas where the background is completely surrounded by the black or painted surface. 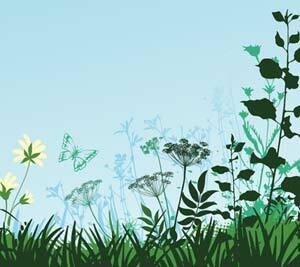 These are common in, say, a field of grass and flowers, where the grass is long and overlapping, or on many complex Celtic artwork. Below are three samples, ranging from difficult (and more expensive) grass and flowers, to an easier flowing pattern, to an easy solid pattern. All of these would look beautiful on any harp, but would vary widely in price. We can put the artwork anywhere on the harp that you envision it, and do multiple locations as well. We’re also just starting to offer custom colorization of the stencils, so that a butterfly could have blue wingtips, etc.